The crew finishes up the pit ground work for installing the residential sewage ejector for a 1,750 square foot ranch home. 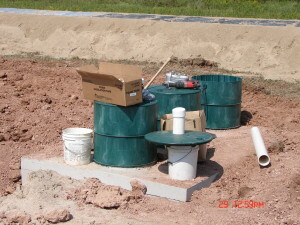 The ejector is ready to be installed for the septic system required in rural areas. 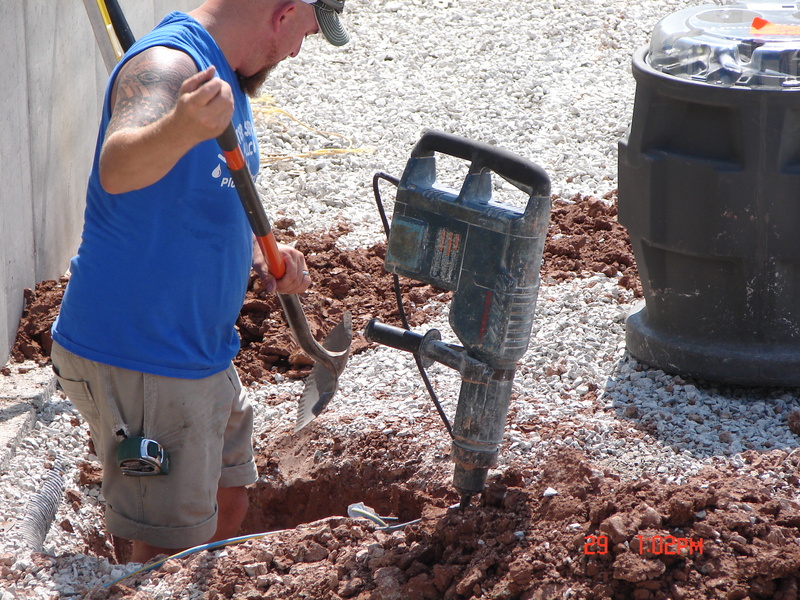 Plumbing installed under a concrete slab is required to have a ejector pit to lift up sewage to a gravity drain pipe above. 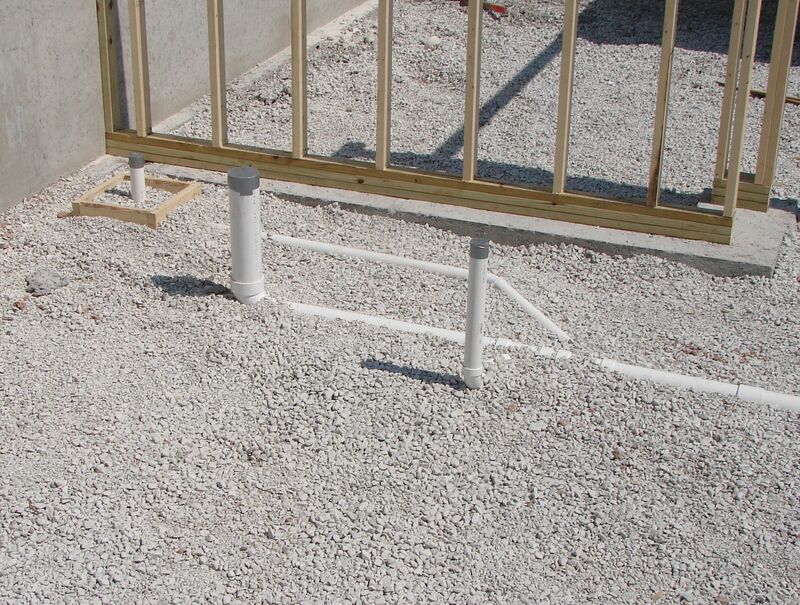 Some septic systems can gravity flow under basement floors. At Smith Bros Plumbing and Septic we can help you determine that. A sewer drain line is shown properly installed and embedded in sand to function properly in sending sewage from the home to the septic system. This insures that after back fill is done on the home. There will be no damage to the pipe that was installed. If more than thirty feet of pipe is installed the pipe will be covered with insulation to prevent freezing. Smith Bros. Plumbing & Septic employees completing final mound preparation for a residential septic system. 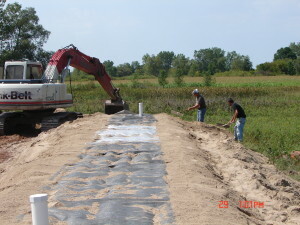 The two observation tubes at the end of the drain field are part of the system to remove acid from effluent (grey water) by filtering it through the mesh fabric and packing peanuts until it can be safely released through the sand as water. There are many different types of septic systems depending on the soils that are on your building site. 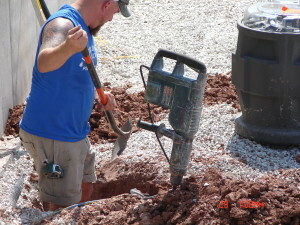 Smith Bros can help you determine what septic system suits your soils and best the site for your septic system on your building site. 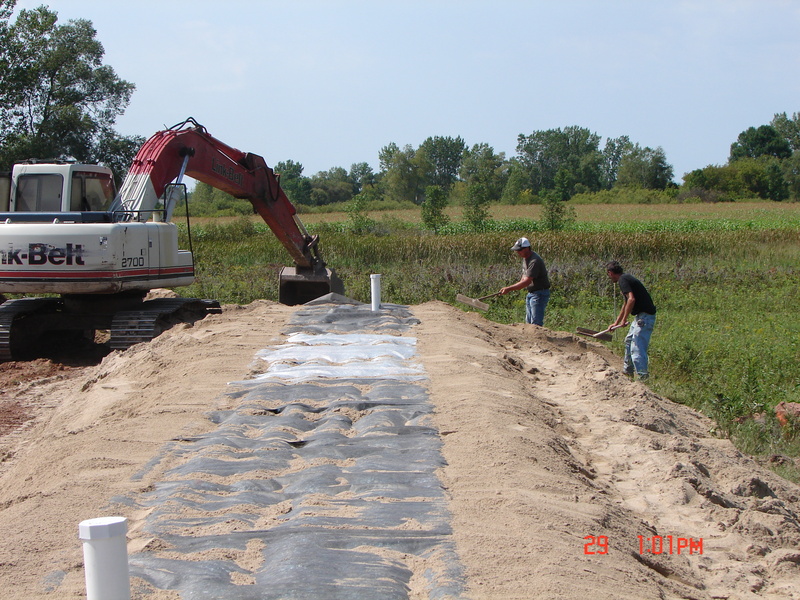 Smith Bros installation of septic system tanks for accepting residential waste and processing it to disperse effluent to the mound system. This is a two compartment tank which has a pump in the back half of the tank and a filter in the front half. Your site might require a different tank set up we can help you determine that. Pipes are roughed in to the residential basement to install sink, toilet, and shower fixtures in the finished bathroom. 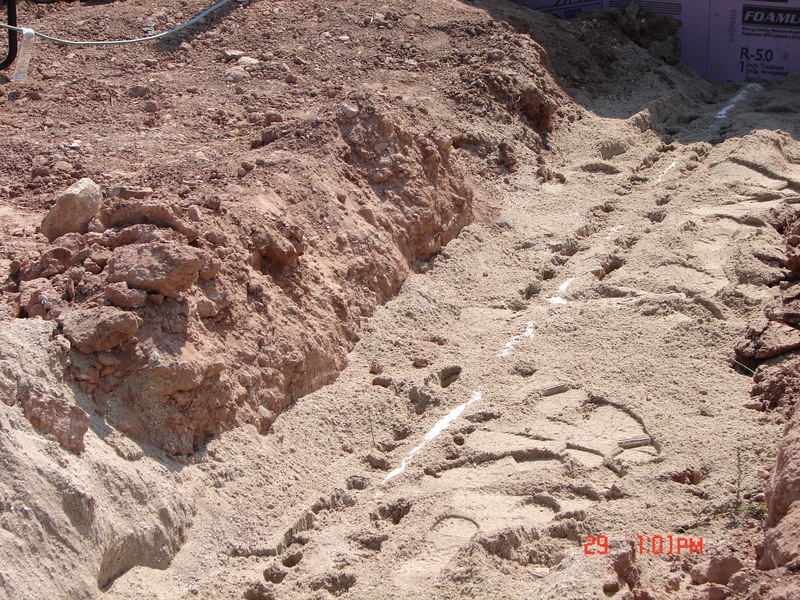 Image also shows drain line carrying effluent to the ejector pit. This is only one of many Plumbing installations. Plumbing installs may include floor drains, bar sinks, hot tub drains, sauna drains, we can even put in a drain for a dog wash! 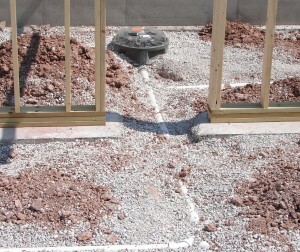 Image shows Water Services finished rough in of the ejector pit with drain lines coming in from various plumbing fixtures that will later be installed in the residence. 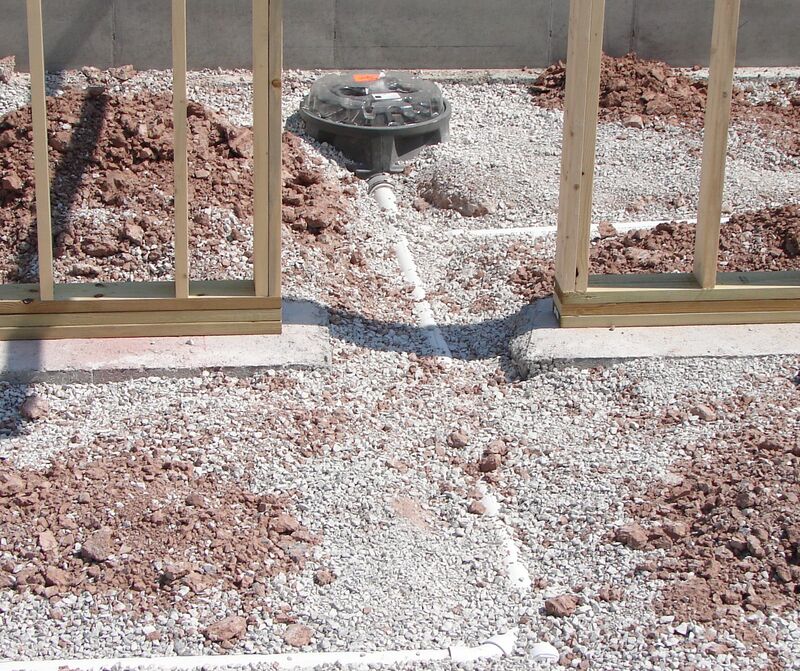 This installation is later sealed in place with a concrete floor poured over the basement surface area. As you can see all pipes embedded in gravel. This is done to prevent the proper pitch of the drains lines to be disturbed, while concrete is being poured over pipes.